A quick and easy Tomato Soup Recipe seasoned with basil and thyme is the perfect comfort food. Make a batch early in the week then easily rewarm for comfort food every night. 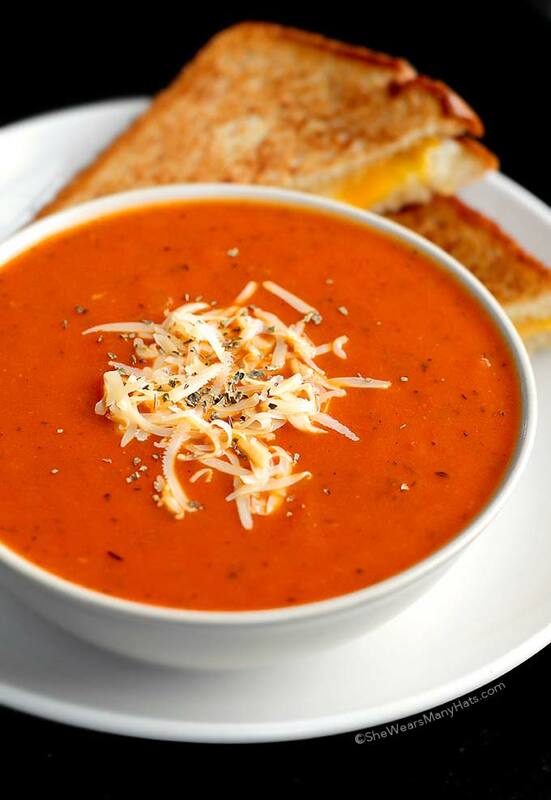 Few things rival comfort food more than a warm bowl of Tomato Soup with a grilled cheese sandwich. It’s simple food, yet absolutely satisfying. I don’t know who discovered the combination, but, as Yoda might say, genius they were. 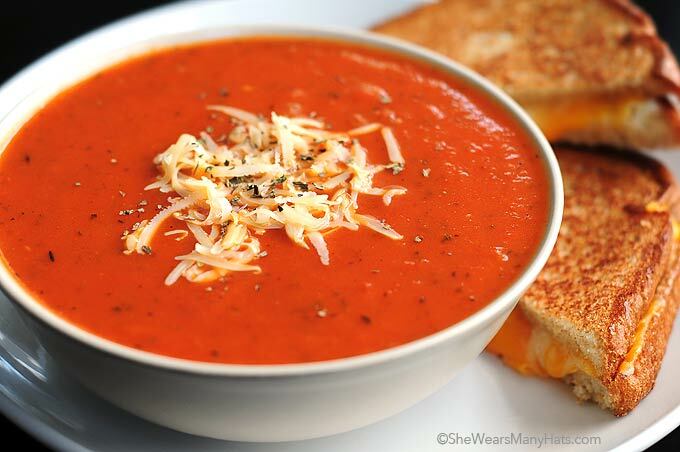 I remember when I first made this easy Tomato Soup Recipe. Years ago, on a Saturday evening in late fall, we were headed back home from a trip to the mountains. I was fighting a cold and Randy was pooped from a day of mountain biking and working on building a bookshelf. It was cold, and windy … and cold. All we wanted was to be home that evening to rest and recoup. As we drove down the windy (as in curvy) and windy (as in blustery) road we chatted about what we could make for dinner without having to make a stop by the grocery store. Tomato Soup and grilled cheese was Randy’s request, and I knew that we just happened to have every single thing we needed in our pantry to make it happen. Our fresh basil had just been hit by the recent frost, but we did have a good amount of dried basil on hand, and that, coupled with dried thyme, would work just fine. As soon as we hit the door I began preparing the soup. It was quick makings. While the soup was left warming on the stove, waiting for our grilled cheese chef (aka Randy) to work his magic on the other very crucial part of the meal, I headed for the yoga pants. 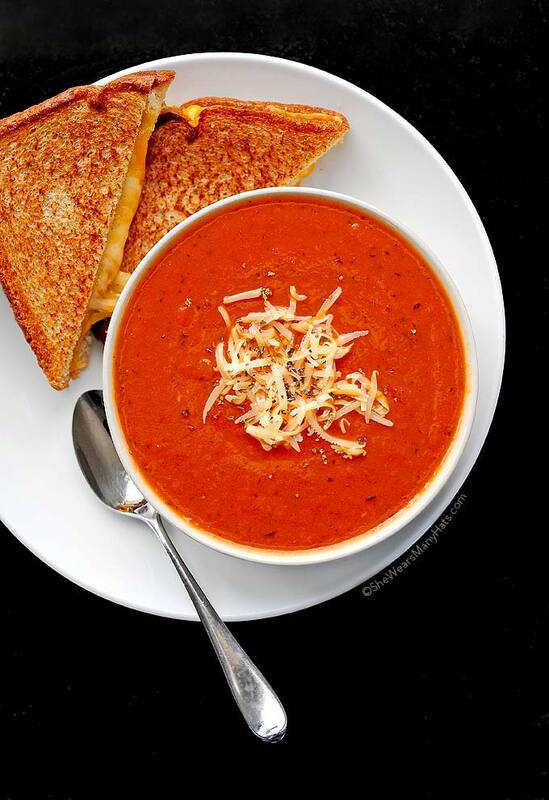 Warm Tomato Soup + Grilled Cheese + Yoga Pants = The perfect Saturday night. And it was. Since then, we’ve enjoyed this simple Tomato Soup Recipe so many times, accompanied by a grilled cheese, of course. This Tomato Soup Recipe truly is easy fixings and hard to beat on a chilly night. Pair it with a grilled cheese sandwich, and you’ll see what I mean. Speaking of grilled cheese, if you like mushrooms, for a nice twist on the classic, try a Grilled Cheese with Gouda, Roasted Mushroom and Onions. Oh my … you’ll be happy you did! When cooking Tomato Soup, it’s best prepared in a non-reactive pan. What is a non-reactive pot or pan, you ask? 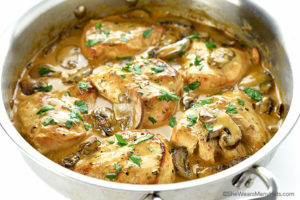 A non-reactive pan is a pan that will not react chemically with certain foods (specifically, acids in tomato for this recipe) creating a metallic taste. When a recipe such as this calls for a non-reactive pan, look for stainless steel, enameled cast iron, glass, or clay. Particularly avoid aluminum or copper. Personally, I like to use enameled cast-iron (note: NOT cast-iron, but enameled cast-iron) or stainless steel pots when making soups and sauces as they conduct heat evenly and there is no concern for metallic taste. For this recipe dried herbs are listed but if you have fresh basil or thyme available, they may be substituted in triple the amounts listed in the recipe. That rule works well for any recipe: 3x fresh to dried herb amounts. For a smooth Tomato Soup, the soup will need to be pureed, but if that is not a concern, skip that step and enjoy! This classic tomato soup recipe, seasoned with basil and thyme, is the perfect bowl of comfort. Make a batch early in the week then easily rewarm for comfort food every night. In a large nonreactive stock pot or Dutch oven, heat oil and butter over medium-low heat. Add the onion and cook, stirring occasionally, about 6 minutes. Add garlic and continue to cook, stirring for another 2 minutes until soft but not browned. Add flour and stir to coat onion and garlic for about 2 minutes. Add basil and thyme and continue to stir to toast about 2 minutes, until fragrant. Add broth, crushed tomatoes, sugar, salt and pepper. Bring to a simmer and stir to incorporate well. Cover, reduce heat to low and continue to cook for at least 30 minutes. If you’re okay with a thicker soup, skip the next step (pureeing), season to taste and enjoy! If you prefer a smooth/pureed soup, allow soup to cool slightly, and using a blender, or food processor carefully purée the soup in small batches of about 3-4 cups at a time, OR use an immersion blender to completely puree directly in the pot. (If using a blender or food processor be sure to vent/crack the lid to avoid steam building up.) Return pureed soup to the pot. Season to taste with additional salt and pepper if needed. Serve warm. If desired, garnish with chopped fresh basil, chives, dill, sour cream, and/or your favorite crumbled or grated cheese. Soup may be frozen in an airtight freezer container for up to three months.Adapted from Fine Cooking. Originally published November 5, 2014. Oh how I’d love to dive into that bowl of soup! I’ve been battling a chest cough and it’s cold and blustery here too! Think I may have to go dig around my kitchen and make some of this yumminess! This looks delicious and hearty! I’m so used to my mother making tomato soup that is a bit thinner and cooking it with some piece of meat on the bone. I love the thickness of your recipe! 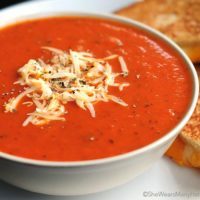 I grew up eating a thinner consistency tomato soup too, but this one is so filling and flavorful and great for dipping! Thank you so much for this recipe. I.do have a question, do you know what makes tomato bisque soup? I went to a restaurant in LA. that had a show with Knights and they served tomato bisque soup.It was delicious and the fort time I actually loved the taste of tomato soup but I do not know what makes it different from regular tomato soup. Is your recipe geared more towards a bisque or regular tomato soup? Hmmm … I supposed this recipe could be considered a bisque or bisque-like since it is of a thicker consistency, and by definition a vegetable based bisque is made with pureed vegetables so that would qualify this as a bisque persay. As far as the recipe you enjoyed in LA, I wonder if they added a roux or cream for thickening? Was it lighter in color? If so, that would be the difference in this recipe versus that one: this one does not include a roux or cream for thickening, only tomatoes. I hope that helps? Amy, sounds about right. It was a little thicker and I never thought about it that way. I will definitely try your recipe and add some roux. Thank you so much. Just made this soup and it is delicious as well as very healthy. I did have fresh tomatoes from my garden that needed used so used them as opposed to canned but the flavor was awesome. The best tomato soup I have had. Will definitely make it again. Garnished it with fresh basil from my garden. I’m so glad you enjoyed it! Wish my basil was still thriving. Thank you for the recipe! I look forward to making this soup very soon! This recipe was so easy, I loved it. Of course we all add our little things that we like. My Mom always added a tin of stewed tomatoes to her tomato soup so I had to do as well. Thank you for sharing!! I have never been too fond of tomato soup but this is delicious. I will definetly have it on my list to make again. I made this tonight and it was a big hit! Thanks so much I loved it! You are so welcome, Cris. I can’t wait for the cooler weather to set in at stay for a while. This tomato soup will be a regular with grilled cheese on the side. Talk about comfort food! Loved this soup and I plan to can it to have on those cold winter evenings when I get home from work. I have to be extremely carefull with sodium so everything iIcook is fresh. My husband loves soups so when I found your site (was initially looking for homemade coffee creamer) was over the moon with what I found. Thank you for this beautiful and useful site. Made this soup this weekend, it was delicious and my 13 year old loved it and requested some for school lunch. This recipe was great! So quick and fun, and soup is great in the colder months. First time making tomato soup and it tastes awesome, whole family loved it. I served it with toasted Italian bread topped with fire-roasted peppers and just aggghhhh so yum. 🙂 Thanks so much. I’ve been looking for a different tomato soup and this sounds great. I like to use all stock and no water. I have made this soup dozens of times now. (making it right now) It is super easy and delicious. The only thing I change is that I leave out the sugar, I am trying to cut back. It freezes well and I like to give it as a gift when a family emergency happens. Thank you for a fabulous recipe. Did anyone have a problem with chewing a bunch of seeds from the tomatoes? The flavor was great, but I kept having to spit out tomato seeds. If anyone has a crushed tomato brand recommendation that doesn’t give me this problem, that would be great! I think the brands I used have been strained because I’ve never noticed that as a problem. I use Tutturosso brand and they are wonderful! Thank you for reminding me I need to have more grilled cheese and tomato soup in my life. It’s been too long! Looks delicious dear! This was awesome!!! Really fantastic. I wanted a great recipe with deep tomato flavor. This hit the spot and went perfectly with FoodWishes Inside Out grilled cheese. SO delicious. Anyway, thank you for an incredible. Recipe. Very appreciated. Do you use medium low heat the entire time? I keep it at a simmer pretty much the whole time. THANK YOU for the easiest, quickest, most delicious tomato soup recipe of my LIFE. I have made this countless times and EVERY time I make it for someone, they rave about how flavorful it is. It’s my go-to meal for a simple dinner that never fails. Yay, Kristie! I’m happy to hear that you enjoy it as much as we do. I tried this soup for the first time…so simple and tasty…next time I will cut the herbs in half as the flavor is a bit strong for my taste…I put it in the blender and ha a perfect soup w/o any seeds at all…thank you???? Hi Amy, can tomatoe sauce be used in place of the crushed tomatoes? Wow, found several recipes that sound relatively easy to make!! Thank you. I will book mark your site! !